My husband, Mr. Craftery, has been working hard the last couple of weekends getting the gardens in our yard full of flowers for the spring and summer. He’s been doing such an amazing job! Our yard has never looked better! Thank goodness for him, because I have absolutely no green thumb. A nice, sturdy cactus more my speed. Even better than that, is a paper version! 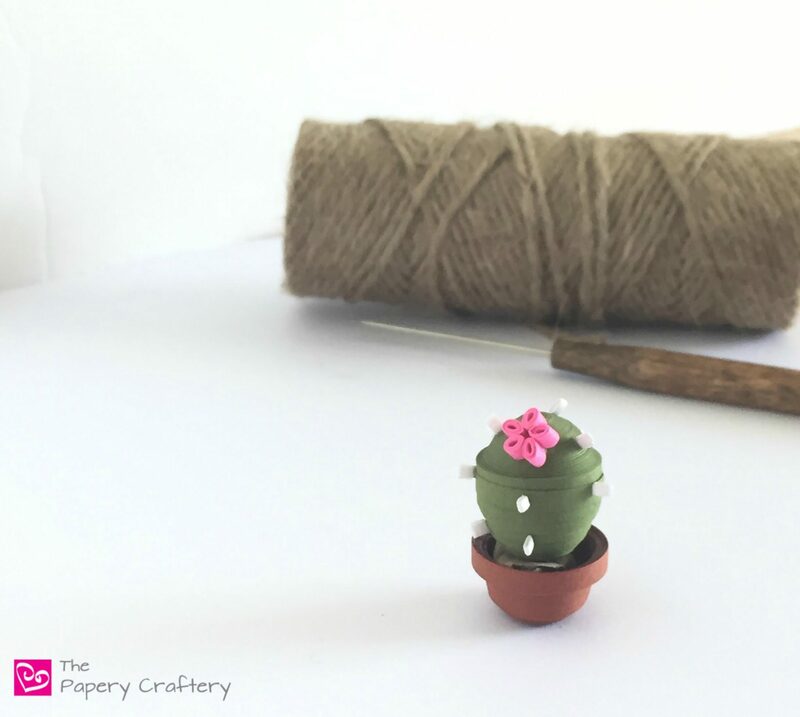 So I was inspired to whip up a quilling paper cactus and share it with my fellow crafters! First, find green strips the shade of your choice. Cacti do grow in a few different shades. Grab some brown and white strips, glue, and a quilling tool, too. My cacti are all pretty small, about 1 1/2″ tall. You can absolutely make these as large as you like by adding more paper strips to each roll. But you know I love my minis! I think it’s partially because I have so many ideas but so little time. If I work on a small scale, I can finish more projects! I started with the main body of each cactus. Roll a tight coil from 3 connected strips, each 22″ long. Repeat to make a second coil. Mold by pushing the center of each coil until a dome is formed. Your fingertips or the rounded end of your quilling tool work just fine for this. But, I’ve recently gotten a quilling mold and I’m really loving it for my 3-d projects. The domes are a lot more even. I did find that the cacti looked a bit more natural if one of the domes was pushed a little further than the other. To set your dome, apply a small amount of glue to the underside, and brush so the entire surface is covered. I also like to add a short strip of green right to the center of the dome to cover the seam where the two halves meet. Of course, your quilling paper cactus needs a pot to grow in! Start with a tight coil of 3 22″ brown paper strips, made the same way as the green. This time instead of molding a full dome shape, gently push only the center of the coil. The very outer edge should stay together, so it looks like the lip of a terracotta flower pot. Lightly press the bottom of your pot against a level surface to allow your pot to sit flat. I wanted my cactus to sit up a bit in the pot, as if it was really planted. A balled-up bit of brown Kraft paper did the trick. The Kraft paper sort of gives the illusion of soil in the pot, too! Add some glue to secure the cactus in the pot. Let’s make this quilling paper cactus spiky! Now, because my cacti are teeny, these spikes are super-teeny! Cut 1″ strips of white quilling paper in half (watch those fingers!) and roll into a tight coil. Once they’re rolled, press firmly to flatten. Add your spikes to your cactus! I highly recommend getting some Tacky Glue for projects like this. Tacky Glue sticks paper together almost instantly, but still moves a bit. Trust me, you don’t want to have to wait 10 minutes holding each spike as it dries. I had so much fun figuring out different ways to make cacti! Some have random spikes; others have spikes in rows. I made a few with simple flowers on top, too! I did make one with arms on the sides that I made from long, bent 3D coils. I only recommend this to those quillers with lots of supplies and patience! It’s a little tricky to get the tubes to bend without completely unraveling. My favorite cactus is one with lots of little buds growing from the top. I made them exactly the same way I made the first part of the cactus, but just with shorter strips. Have fun making your quilling paper cactus! Experiment! Make an entire desert! And while you’re quilling mini’s check out my tutorials on mini mushrooms and citrus slices! Just adorable!!! My husband is also the “brains’ behind our garden…tomatoes, zucchini squash, spaghetti squash and eggplant are our standards, we’ve tried carrots but failed miserably! There’s nothing like going into your backyard and picking your own vegetables! As far as flowers go, the only ones we’ve had success with year after year are mini roses. I always enjoy seeing your creative ideas!! Thanks so much, Gerri! It’s good to hear from you! My husband has some goals for veggies this year too. We’ll see how it goes! Good luck with your veggies…it’s so cool to plan a meal knowing you can just go out to your garden and pick your own fresh vegetables! I have a great recipe for ratatouille and almost everything I need to make it is growing right outside my back door! Hope all is well with you and your family, and keep the great quilling ideas coming! I really thought your pots were terra cotta. So realistic.